Home >> Analysis and Features >> IndiGo, AirAsia India, Spicejet top on-time for 2018. Chennai airport tops. The ramp at Rajiv Gandhi airport, Hyderabad. Photo by Devesh Agarwal. Used with permission. Do not re-use. 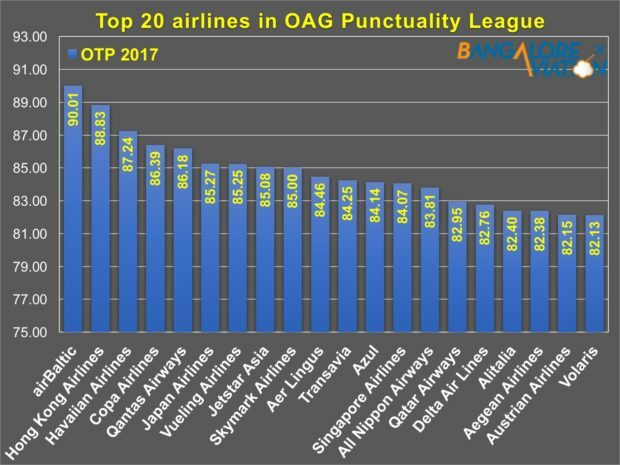 Three of India’s low-cost carriers, IndiGo, AirAsia India, and Spicejet feature in the OAG’s Punctuality League 2018 as India’s most punctual airlines. 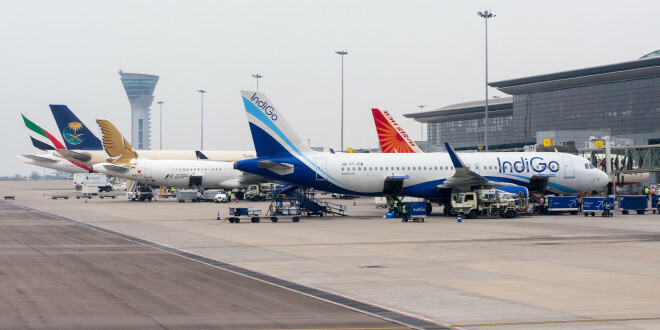 Chennai, Hyderabad, and New Delhi airports also feature in the annual report of airlines and airports with the best on-time performance (OTP) in the world. OAG Punctuality League 2018. Top 20 airlines. Graphic by Devesh Agarwal/Bangalore Aviation. Data from OAG. Curiously, low-cost carriers who depend on a quick turnaround and efficient operations don’t make it in to the ‘Top 5’. Spanish LCC Vueling the most punctual LCC is ranked seventh with a OTP of 85.25% and a coverage of 82.2% of its flights. It is closely followed by another LCC, JetStar Asia with on OTP of 85.08% and a coverage of 86.5%. Only three Indian carriers, all of them LCCs, feature in the top performers list. IndiGo is ranked fourth in the ‘Mega’ airlines category, and ninth among all airlines in the Asia-Pacific geography. Mega airlines are the Top 20 airlines of the world measured by number of flights despatched. 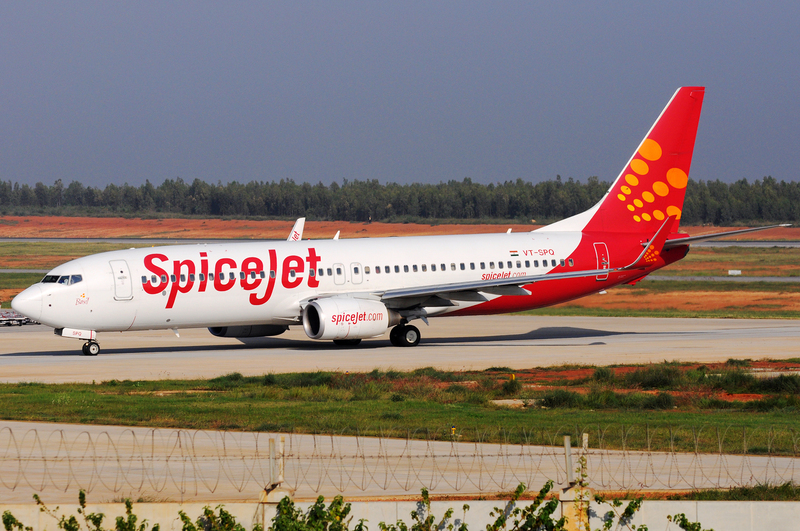 AirAsia India and Spicejet join IndiGo in the global ‘Top 20 LCC’ category. While not published, if measured on an overall basis, IndiGo will be ranked 26th globally. Bangalore Aviation reached out to the three airlines for their reactions on achieving this feat. 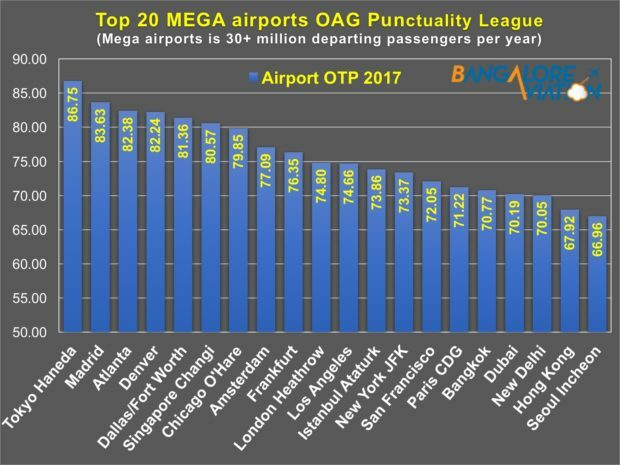 Like the airlines, only three airports in India feature in the Punctuality League 2018. The Indian airport with the best on-time performance in 2017 is, Chennai. It is ranked a joint 11th along with Washington Dulles airport in the large airports category (10 – 20 million departing passengers per annum). Chennai had 81.79% of all its flights, departures and arrivals operate on-time. It is an amazing performance given that the Airports Authority of India, a government department, operates the airport. The other two airports are operated by private consortiums led by GMR. Hyderabad airport was ranked 17th, five ranks below Chennai with an overall OTP of 80.46%. New Delhi airport with an OTP of 70.05% was ranked 18th in the Mega airports category (over 30 million departing passengers per annum). The on-time performance reports published by India’s DGCA, rely on data from only four private airports in India. 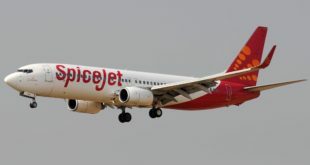 The DGCA reports fail to cover flights to or from Chennai and Kolkata, the fourth and sixth largest airports in India. The fact that Chennai is India’s most punctual airport would be undiscovered if one were to rely on the DGCA reports. Larger airports like Ahmedabad, Jaipur, Lucknow, Kochi, and Pune are also left uncovered. As analysed by network planner Ameya Joshi, less than one-third of all domestic flights are tracked for on-time performance by the DGCA reports. In comparison, the OAG computes OTP when it has data covering a minimum 80% of flights operated by an airline or at an airport. A broader coverage will naturally reflect more reliable and accurate on-time performance report. As an example, the DGCA reports track only about two-thirds of IndiGo’s flights. OAG has tracked almost all (97.1%) of IndiGo’s flights. Which report do you feel will give you a more reliable number? Share your kudos and thoughts via a comment. ranking of the best on-time performance (OTP) for the world’s airlines and airports. “On-time” is defined as a flight that arrives or departs within 14 minutes and 59 seconds (i.e. less than 15 minutes) of their scheduled arrival or departure times. For airports both arrival and departure times are used for OTP calculations, while for airlines it is just the arrivals.